This is a new addition to my gyan – and an apposite translation of “Hingpustaktalwar” or हिंग पुस्तक तलवार ! No – this isn’t gibberish, but a concatenation of three words from the Indo-Aryan language family. Yes – it’s another family meme. And like with most family memes, the origin of this one is now forgotten –it probably was a story of a man who was given an incongruent shopping list featuring some asafetida, a book and a sword. This description is used and abused in the family for an unrelated shopping list, a mélange menu or a higgledy piggledy composition or an ensemble gone awry. Generations of girls, including the in-law variety, have suffered disproval and diatribes from the dynasty dames for “hingpustaktalwar” menus and dishes, be it a wedding feast (especially one hosted by the in-law party) or a family dinner. Interestingly, this throwing together of disparate elements of taste, texture, temperature, colour, cuisines, condiments actually yields great results, as I experienced with this salad. Why was this disparate and unlikely? First of all, the dish comprised raw ingredients topped the blanched beans in a mélange of fruit, vegetables, nuts, herbs and spices. Granted, a dish “… in an orange reduction” has enhanced snob value for some. But for the incredulous me, the idea of oranges in savoury dishes had taken a while to go down. For this dish, I had even- by sheer force of habit- sliced and segmented the oranges on my fruit chopping board (the one that is never allowed to be used for cutting vegetables) only to realise I was mixing the fruit with raw onions. Wasn’t I being foolishly intrepid, blending flavours of orange, thyme and garlic? Was I overreaching myself- tossing oxymoron textures of crunchy beans and luscious oranges? What was with this droll plating of the Kandinski-esque cuts, colours and contours of components in this eclectic salad? And most importantly - would the family like it? Would this dish be a suitable complement to the pumpkin risotto the daughter had made for dinner that night? The salad was such a winner, that now I really want to call mother or my aunts and ask if anyone remembers the story of that poor man – I am dying to know what he did with the asafetida, the book and the sword. NB. Tangelo is a hybrid of a tangerine and a pomelo (grapefruit). You can see the blood orange in the photo. Boil a medium pot of water and prepare a bowl of ice water. Add the green beans to the pot and cook until crisp-tender, about 3-4 minutes, and then plunge them into the ice water to stop the cooking. Once cool, dry the green beans completely and season with salt. Using a sharp knife remove the skin and pith from the second tangelo and carefully slice in between the membranes to get the petals out. Combine the juice and a tiny bit of the zest of one tangelo in a large bowl and add the herbed oil or 1 tbsp extra-virgin olive oil, a spot of garlic, thyme, salt and pepper. Mix well. 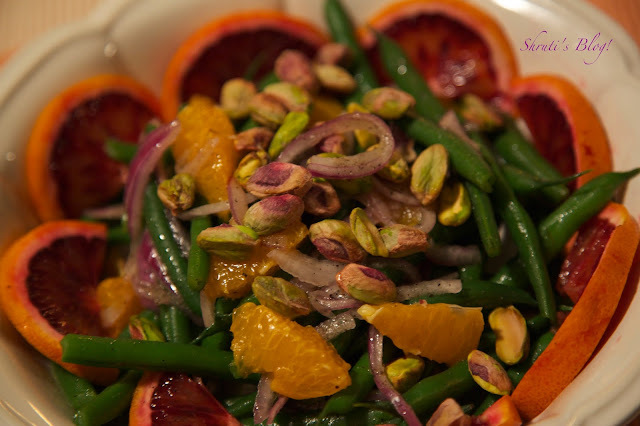 Toss in the green beans and sliced onions in this dressing to combine and taste again for seasoning. 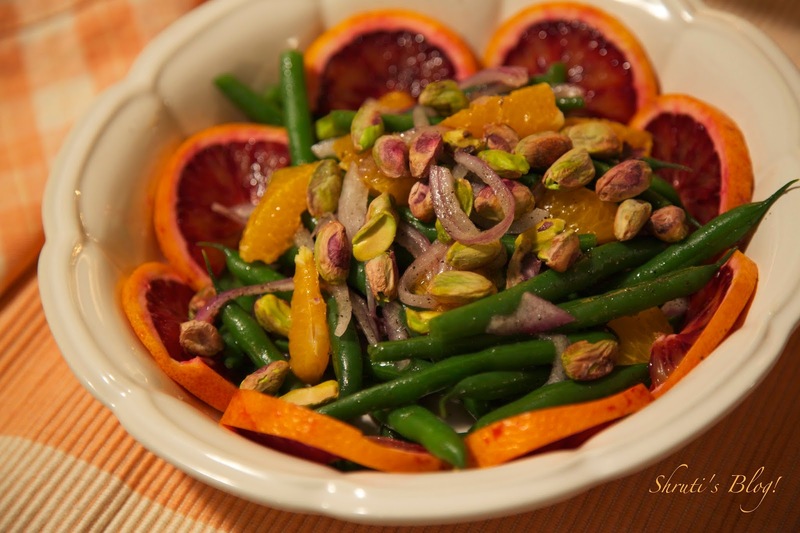 Arrange the beans on a serving plate lined with the blood orange half- slices. 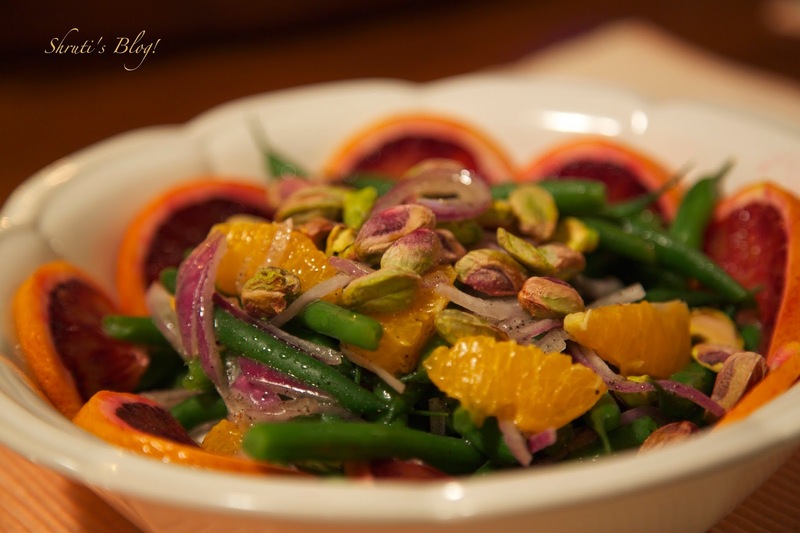 Garnish the beans with tangelo sections and pistachios.